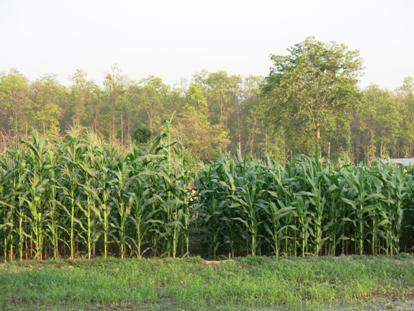 In Terai, farmers were initially skeptical about growing maize in the dry spring period, with one farmer’s wife berating him for sowing maize on land she thought they should grow a fodder crop on. 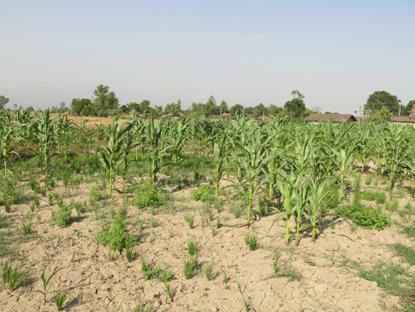 By about two months after planting, she was delightedly admitting being wrong, and showing visitors their maize field, with both the farmer’s variety and a hybrid, both under farmer management and recommended nutrient and establishment practices. All hybrids tested yielded at least 2 t/ha more than the farmer’s open pollinated variety (OPV), Arun-2 — which also yielded over 1 t/ha more with improved management than under typical farmer management. Yields of the Rajkumar hybrid that farmers voiced early preference for were often doubled, at over 10 t/ha with just 3 irrigations. Hybrid yields under farmer management were comparable to or better than OPV yields under best practices, leading several farmers to state that they wanted to expand spring maize area next year and plant the Rajkumar hybrid by line-sowing as introduced by CSISA-NP rather than the traditional practice of broadcasting: they said that although initial time for line-sowing might be high, applying irrigation and weeding were cheaper and easier in the line-sown plots. Feed industry representatives invited to visit the plots were also pleased with the hybrid maize, and told farmers that they could guarantee the purchase of these farmers’ hybrid maize at the same rates as they currently pay Indian producers if they could increase production, as currently purchase over 200 t of maize annually from India at NPR 24/kg to meet demand. Following the discussion with feed company representatives, CSISA-NP participating farmers in the far-western Terai project sites were able to negotiate higher prices (about NPR 4-5 per kg) from the (non-feed company) buyers of their maize.